I am submitting a photo of our 2 year old GSD, Tesla. She has a great personality - very sociable and friendly and loves to go on outings, yet on guard and fierce when necessary at home. She is never aggressive to dogs in public. It is always other dogs who growl, bark or want to start something with her. She has a 12 lb. playmate at home, a male tabby cat, who entices her to chase him and play boxes with her. Tesla is great with our 3 cats. She has also had her share of medical adventures, from having baby teeth extracted to having TPO surgery on her hips when she was approx. 8 months old, to getting hit by a bad driver of an ATV. Love the name - did you name her after the scientist? 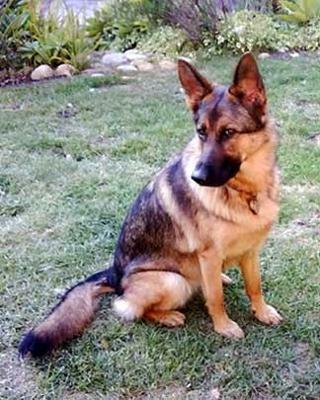 Either way, it's a great name for a German Shepherd - I'll have to remember that as a choice later on. Sounds like a great pup.